Infused edibles are an accessible entry point for many cannabis newcomers, being mostly food by volume. 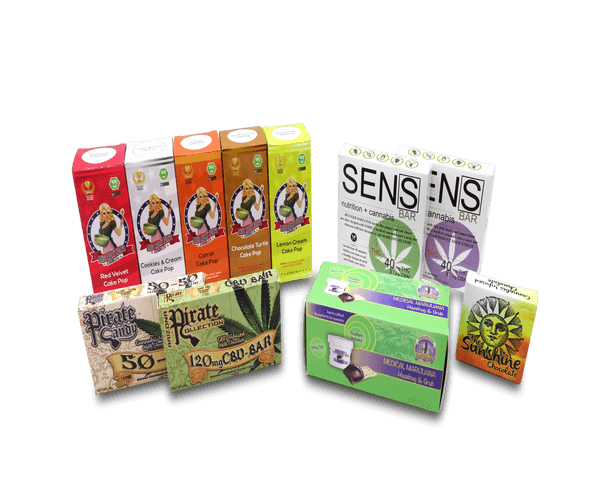 Since edibles get so much scrutiny from both connoisseurs and curious consumers alike, having appealing, high-quality edibles packaging is key—and that’s where Business Image Printing can help! Bring your packaging concept to life with lush, soy-inked colors on durable 24-pt paper, produced by a team with years of experience creating food, cannabis, and edibles packaging. Apart from being budget-friendly, your pricing also includes free consultations, samples, and more to make sure you’re getting exactly what you need for your edibles packaging. Wanna go the extra mile with special textures and accents? We’ve got you covered. To get started, just click “Custom Quote” above or email us at sales@businessimageprint.com for more complex inquiries. All quotes are sent within 36 hours of your original message!